For those that say you cannot buy happiness, then I must disagree. After all, Crabtree & Evelyn’s newest fragrance only recently launched. I assure you that once you smell this romantic treasure of their Wisteria that feeling of happiness will carry you with it to your private garden in the English countryside where you’ll rein like a queen over the tranquil beauty of those blue blossoms until you’re almost giddy with pleasure. This is the perfect, light floral fragrance for anyone with need of an escape and a mood lifter. Those wisteria blossoms are enhanced with gardenia and ylang ylang blossoms to add to that romantic feeling and accented with fresh fruity notes of mandarin and nashi pears for more sparkle. A hint of airy musk for gentle seduction emerges once it dries down to make this simply impossible to resist. Sweeter still, Crabtree & Evelyn’s Wisteria Eau de Toilette that I was sent for this review and giveaway is free of parabens, phthalates, mineral oil, or propylene glycol. I can’t say enough of how much I love this bright fragrance and know you would agree with me once you get a whiff for yourself. If you’re unsure about that new scent to pick up for Mom for this Mother’s Day, then Crabtree & Evelyn’s Wisteria Eau de Toilette definitely should be on your radar. This scent is available in body lotion, cream, and matching bath gel as well. Trust me, readers, this one is a winner! 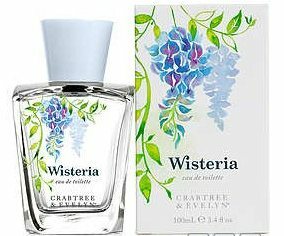 Thanks to Crabtree & Evelyn, one lucky Nuts 4 Stuff reader in the continental United States wins a Wisteria Eau de Toilette Spray 3.4 fl. oz. size ($45 value)! 1. You must follow me on Google Friends Connect before any of your entries will count. If you already follow, then INCLUDE your **EMAIL** along with the name you follow me by in a comment. 2. Go to Crabtree & Evelyn and tell me another product you would love to try or something you learned about them in a comment. Leave a separate comment for each entry. Be sure you include your email address inside your comment so I can contact you if you win. This giveaway is only open to residents of the continental United States. No PO Boxes just USA-based street addresses. This giveaway ends May 8, 2012 at 12 PM Eastern Standard Time. The winner will need to respond to my email with name and shipping address within 48-hours or another winner will be picked. Entered the EatSmart Precision GetFit Digital Body Fat Bathroom Scale Giveaway. I would love to try the Iris EAU DE TOILETTE. I would like to try the Avocado, Olive & Basil Skin Revitalising Body Lotion.